Medium - $34.99 Only 5 left! It doesn’t really matter what time of year it might be, because the call of athletics is always ready to be answered. But, when the season is right, there is always the fast rush to the stadiums (and the online leagues) for victory to soon commence. Well, fall is here and we all know that means we are about to see plenty of announcements and decorations for our most beloved of costumed holidays. But, there is another tradition of celebration that involves dressing and gearing up, running down yards to collect your prize, and that inspires the communal cheers of the locals. Of course, the real problem with competing seasons is how much attention that they pull from each other. But, this year, you can bring them together with this fantastic, NFL Cardinals Uniform costume. 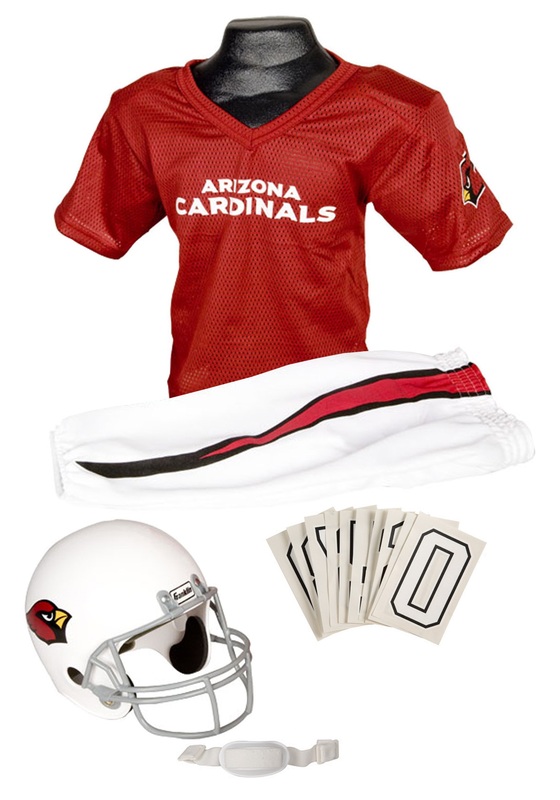 The red jersey features iron on numbers for your favorite position and the “Arizona Cardinals” printed in bright lettering on the front. The elastic white pants have the iconic black and red stripes and the matching helmet snaps on with each and features the Cardinals logo for all to see. Now, rush to the end zone and score victory for your team!